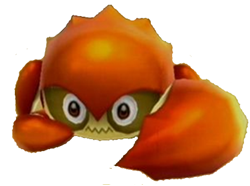 Crabbers are a type of Crab found in beach galaxies of Super Mario Galaxy and Super Mario Galaxy 2. They are shown to have a big left pincer and a small right one. Mario has to defeat the creature by Spinning at its rear. This can be tricky, as Crabbers always face Mario. So, Mario first has to spin in its face or Jump on it. The Crabber will defend itself with its big pincer and will stop following Mario, so he can Spin at its exposed backside to defeat it. Crabbers come in two colors: red and cyan. Red Crabbers are less skittish than blue ones, so they are easier to defeat, as they come closer to hurt Mario. They leave Star Bits behind when defeated. Cyan Crabbers are harder to defeat and fear when Mario or Luigi is near them and run away. They leave a 1-Up Mushroom behind when defeated. In Super Mario Galaxy, Crabbers are found in galaxies with a beach, meaning Beach Bowl Galaxy, Sea Slide Galaxy, and Deep Dark Galaxy. They walk sideways like normal crabs, and try to defend their rear by facing Mario when close. In Super Mario Galaxy 2, Crabbers reappear once again in some beach galaxies such as Starshine Beach Galaxy. Yoshi also appears in this galaxy, and can stuff Crabbers in his mouth. Yoshi cannot convert them into Star Bits, but can spit out their big pincer in the same way as a Spiny Egg or Bullet Bill. The pincer acts as a boomerang, as it flies out for some distance, then returns. Several Crabbers also appear in a Prankster Comet mission of Boulder Bowl Galaxy, named Rolling Crabber Romp. Rock Mario must defeat 30 Crabbers in one minute to get the Power Star. Its large claw is based on the large claw of a fiddler crab. This page was last edited on September 26, 2018, at 22:47.